ALLNUTRITION VIT D3 2000 is a supplement to the daily diet in vitamin D3, essential for the proper functioning of the body. The practical and convenient form of gel capsules makes it easy to take this amazing dietary supplement. This preparation provides up to 1000% of the reference intake value for vitamin D! Vitamin D occurs in two forms: cholecalciferol (synthesized in the skin or derived from food) and ergocalciferol (formed from ergosterol found in yeast and mushrooms hat), They are the starting substances that in the body are transformed into active compounds that have hormone-like activity . Vitamin D helps in the proper absorption of calcium and phosphorus, maintaining healthy bones and teeth and has a positive effect on the proper functioning of the muscles and the immune system. 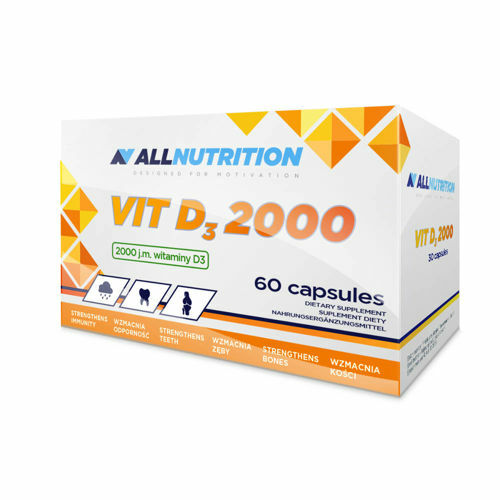 Dietary supplement VIT D3 2000 is particularly recommended for physically active people and those who want to maintain good form and health. 1 capsule a day with water. Warnings: Do not exceed the recommended portion to be consumed within 24 hours. Do not use the preparation in case of hypersensitivity to any of its components. Do not use the dietary supplement after the minimum durability date. The date of minimum durability is on the side of the package. The product is intended for adults. If you need to take oral anticoagulants at the same time, it is advisable to administer vitamin D at a different time due to the interaction with calcium in the blood coagulation process. Dietary supplement can not be used as a substitute for a varied diet. A balanced diet and a healthy lifestyle are recommended.